I’m tired. Sluggish, drowsy. I’ve been sleeping a lot but still in the daytime I feel fatigued. I’m going to bed really early and waking up way too early, but I don’t feel any healthier, wealthier or wiser yet. I’m definintely less irritable and anxious, although the recent mysterious failure of my home internet gateway has me dreaming of smashing it to bits. But I think that’s normal. Wow … I feel so much better than I did yesterday. The headaches have mostly passed. I hope I’m over the worst part. 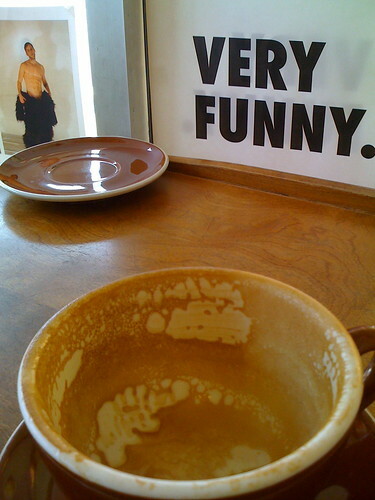 Now the problem is the interestingly-shaped hole in my life that coffee used to fill. My head aches, on schedule. It comes and goes, accompanied by thirst — it’s a very hot day — and a heavy-lidded disorientation. It would be a good day to spend in bed, but it’s way too hot. And I promised my friends Seth & Missy that I would help demolish their bathroom. I’ve got to stop drinking coffee. Coffee makes me anxious. Coffee plus the Internet makes me downright livid. It gives me apocalyptic moods. Surely, the world is not going to end just because Fox news is lying this morning. But don’t try to tell me that after a cup of coffee. This morning was awful … visions of wing nuts screaming bloody revolution because the president is trying to improve my health care. I could scream. Coffee messes with my head. I think it drives me toward short-term thinking, crisis-mode planning, seeing trees instead of forests. I am distractable, irritable, easily offended. I lose track of what I’m doing, and bounce around the house like a pinball. Have you noticed it’s fall already? True, the leaves aren’t turning yet, and nobody’s harvesting pumpkins. But still, it must be autumn because the autumn issue of MAKE Magazine is now hitting the stands — including my article on our famous Speed Vest! I am so proud! I feel like I crashed a smart-people party!